This Sunday I'll be taking part in the Battle of the Cartoonists at the launch of The Big Draw at the V&A in London at 2pm. 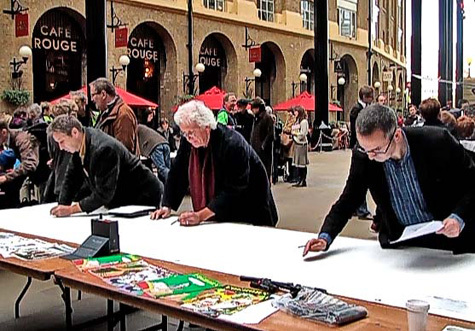 I took part, on the Procartoonists.org team, in 2008, at St Pancras International, and in 2010, above, at the Hays Galleria. I had planned to sit this one out but at the last minute another team was needed so Reader's Digest was asked to form one and I was asked if I wanted to take part. The full list of teams is: Private Eye, Reader's Digest, The Sun, The Telegraph, The Guardian/Observer, Big Girls Drawers and Procartoonists.org. The seven teams will be tasked with coming up a comic response to seven cartoons (the non-funny kind) by Raphael. And we don't know which one we'll get until minutes before we start! See the full list of cartoonists taking part here. To see more about the launch, which this year is called Big Draw, Big Make and runs from 11am-5pm, go here and download the programme. Come along and, er, nod approvingly ... apparently there's no clapping or cheering allowed in the Raphael Room! "Ohmigod, what big ears she has! Ohmigod, what a big nose she has! ..."
Here's another cartoon from the Animal Crackers exhibition at the Cartoon Museum in London. This is an old Private Eye one. The exhibition has almost a month to run (it finishes October 21) so get along to see it if you can. The museum took a bit of a beating when it comes to visitor numbers during the Olympics, and has started opening seven days a week to make up the shortfall, so now is the ideal time to support it. I took my kids along to see Animal Crackers recently and they had a great time. 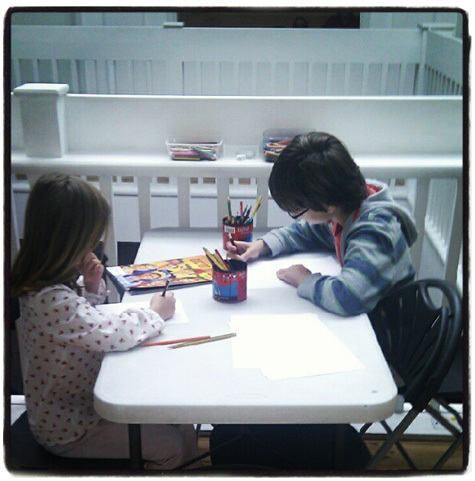 There's a "cartoon trail" for them to take part in and plenty of opportunity to create your own cartoons, above. The next exhibition, from October 24, celebrates 75 years of The Dandy, so I'm sure we'll all get along to that one too. Buy Royston's cartoon book ... also available in the Cartoon Museum shop! 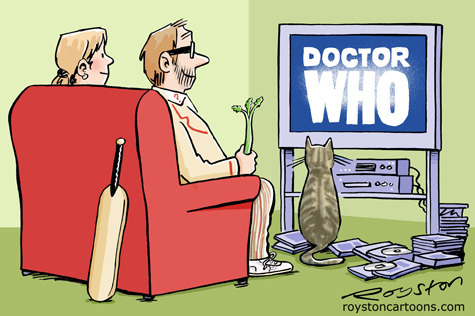 I drew a "regenerated" version of my cartoon for the Doctor Who fansite Adventures with the Wife in Space, as Neil and Sue Perryman, who have been watching an episode of the 49-year-old series every day from the very beginning, are now on to the Peter Davison years. And the fifth Doctor was famous for a love of cricket and, er, celery. The original version, in which Neil wears a Tom Baker scarf, was drawn last year for when the project got its own site (it had previously been part of another site). As you can see, Neil also inflicts some of the dodgy spin-offs on his long-suffering missus. He asked if I was OK with him "customising" the cartoon for different episodes, with different screenshots and captions. I would normally be wary of allowing people to alter my drawings in this way, but it works for this site. If you haven't yet seen the site, check it out at wifeinspace.com. It's very funny. 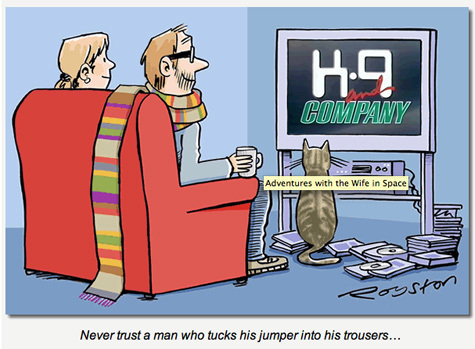 And you can see lots more of my Doctor Who-based cartoons here. This cartoon, about the role social media has played in uprisings and revolutions around the world, can be seen at the website of the Doha Centre for Media Freedom. 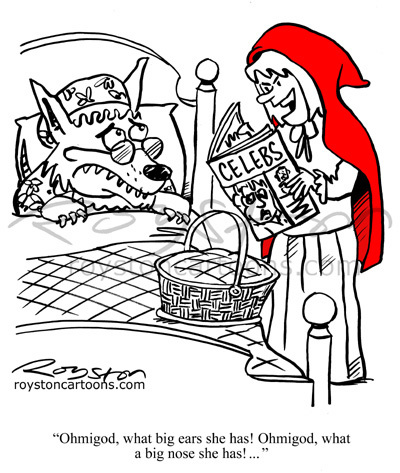 Cartoons can also play a role in taking leaders to task. 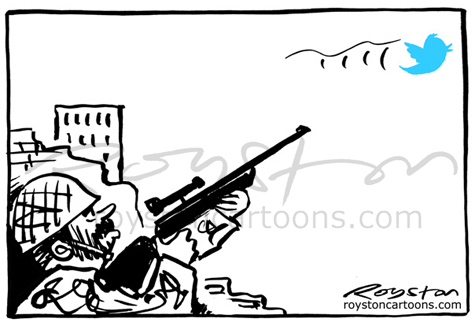 And sometimes they don't like it, as the current case of Aseem Trivedi shows.